When viewed in the grand scheme of things and in light of life's serious problems, fashion, trends, style can seem very unimportant, fluffy, superficial, so temporal, perhaps even boring. I watch runway models on television and I am incredulous that people take fashion so seriously and that there is an enormous industry built around what a few have decided will be next, drape it on walking sticks and then parade the result for admiring hordes who hang on every crease. But then we are not always looking at the grand scheme and it's not healthy to only live indulging in life's serious problems. And a world without style would be a more boring one. We don't want our lives to be guided strictly by utility and designed by bookkeepers. We need style just like we need flowers and parades - see here for my articles: Gratuitous in Nature and Let's Have a Parade. I have only been into Trash and Vaudeville once, many years ago. I considered it a must-do since I have walked by it literally hundreds of times and it is a landmark retailer, located on the major thoroughfare in the East Village - St. Mark's Place. It occupies two floors (Trash upstairs and Vaudeville in the basement) at number 4 St. Mark's, an 1831 Federalist Style building. I only vaguely recall the visit and did not spend much time. The store's origins goes back to 1971 and has been a destination for punk and goth clothing and shoes, with a history of selling to celebs such as the Ramones. 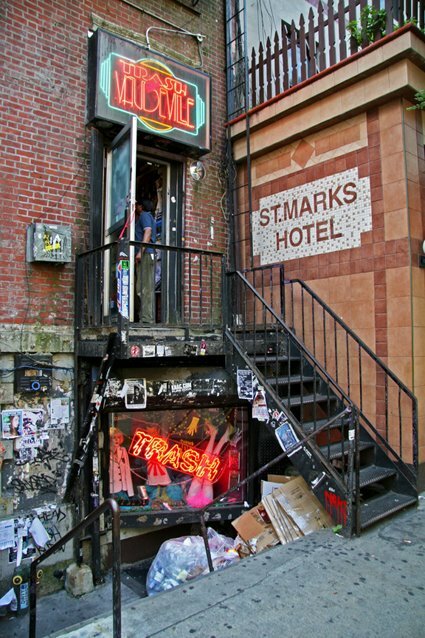 Perusing various online review sites, I see the place is still looked on quite favorably by many, so I imagine this place would be fun for those disposed to the punk/goth genre. Photo Note: I originally took this photo because I thought the pile of trash in front of Trash was so appropriately ironic. But my posting took its typical twists and turns in the course of writing.